Lakewood Universal Traction Bars Length: 28"
Designed to fit most leaf springs, these bars strengthen rear suspension and reduce wheel hop. They are constructed of heavy gauge rectangular steel tubing and feature MIG welded brackets for extra strength. Rubber snubbers, U-bolts, and installation hardware included. Lakewood's rugged traction bars are designed for leaf spring suspensions. Use them on the street or strip to increase traction, eliminate wheel hop, and provide a better ride. 20470 - Lakewood Leaf Spring Traction Bars is rated 4.3 out of 5 by 4. Rated 5 out of 5 by BillPerry from Great product and fast shipping!! installed these on a 1963 Chevy II , no issues. Just install as close to level as possible as by instructions. Rated 3 out of 5 by rerwin31 from Easy mounting& clear simple instructions! 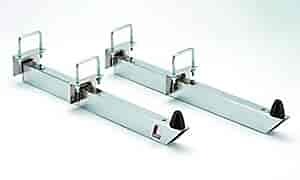 This is my 3rd set of Lakewood traction bars, I have owned 3 Dodge Dakota 5.9 R/T's & have bought a set for each! Great product for the price! Only issue I've had was on this 3rd/last set I ordered, & that was nothing but the Lakewood stickers that go on the sides of the traction bar are too big & won't fit. I'm going to contact Lakewood or the seller & see if they'll send me the right size for no extra fee! Will they fit a 1984 chevy silverado 1/2 ton? This is not recommended to be used with your series of Silverado. Will these fit a 2008 Dodge ram 1500 lifted 6in? No, these are not recommended for your application.